Whether you want to dress like the undead or show off a bold zombie graphic in your attire, the selection of zombie-themed apparel that we offer here gives you creative options for displaying your enjoyment of these grotesque creatures. We carry a variety of zombie t-shirts and zombie hoodies for men and women that allow you to wear something zombie-inspired at any time of year. Our zombie clothing designs range from gory to funny, so you can find something according to your taste. Many of the zombie humor tees make use of pop culture icons in their prints, such as our Walken Dead shirt or Zombie Care Bear shirt. Others mimic the bloody wounds and decay of the undead, making them excellent additions to zombie costumes. Pick out your favorite pieces of zombie apparel to wear as comfortable casual wear any day of the week! The fashion of the undead is not only for adults! Zombie fans come in all shapes, sizes, and ages, which is why we offer a number of junior zombie t-shirts for children and teenagers who enjoy apocalyptic style. Our junior t-shirts are sized slightly smaller than adult t-shirts, many made in slim cuts and fitted designs. One thing all of our junior zombie shirts have in common, though, are their rocking zombie themes! Ranging from hilarious to gory, virtually all of our youth zombie t-shirts show colorful graphics and fun slogans inspired by the end of the world. Whether you want to wear a frightening zombie tee on your day out on the town or a funny zombie shirt on weekends, you are sure to find great options here. Now you can show your love for zombies every day of the week with this selection of comfortable zombie t-shirts for men! 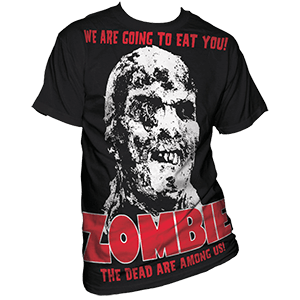 We offer an assortment of funny and gory zombie-themed shirts for guys that make excellent casual wear options. Our mens zombie humor shirts embrace pop culture icons, offering a twist on popular icons and phrases like the Subway logo, Care Bears, and Keep Calm and Carry On. Alternately, several of our zombie graphic shirts embody a creepier look with reaching zombie hands and bloody text. 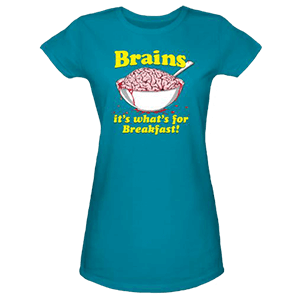 We also carry licensed iZombie t-shirts and Shaun of the Dead t-shirts for fans to enjoy. If you love zombie style, then be sure to collect a few of these undead graphic tees to add to your wardrobe! Transform yourself into the ghoul of your dreams with the fantastic womens zombie t-shirts you will find here. These ladies zombie tees will provide any fan of the undead with clever designs inspired by the shambling horde. 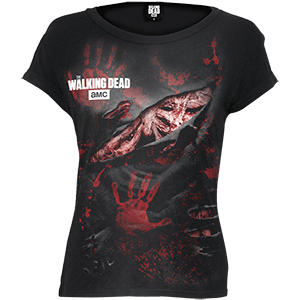 We offer an assortment of funny and gory zombie-themed shirts for gals that make excellent casual wear options. Our womens zombie humor shirts show off zombie crossing signs, zombie pin up art, and other amusing designs. Alternately, several of our zombie graphic shirts embody a creepier look with reaching zombie hands and bloody text. We also carry licensed iZombie t-shirts for fans of the show to enjoy. If you love zombie style, then be sure to collect a few of these undead graphic tees to add to your wardrobe! If you want to look cool during the zombie apocalypse, make sure to check out the fun zombie accessories that we carry here. 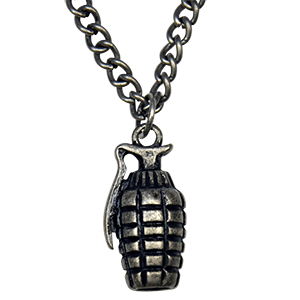 Our zombie jewelry and survival jewelry will appeal to anyone who plans to fight back against the shambling hordes. We carry zombie pendants, zombie necklaces, zombie rings, zombie bracelets, zombie earrings, zombie dog tags, and other bold designs for guys and girls. Our biohazard jewelry shows off the iconic warning symbol, while our other tactical jewelry displays weapons like bullets, razor blades, grenades, knives, and brass knuckles. Other functional pieces include paracord bracelets and compass wristbands, which will provide you with a length of parachute cord in an emergency. Other designs offer useful elements like bottle openers, ensuring that you will not be unprepared when the outbreak occurs. We make it easy to enjoy the style of the walking dead on a daily basis! During the zombie apocalypse, good footwear is a must. This is true whether you plan on becoming a zombie or surviving the horde! We are your one stop shop for all things zombie, including an excellent range of zombie footwear for men, women, and kids. Our survival footwear includes an assortment of combat boots, military boots, and other tactical leather boots that will keep you moving in urban, rural, or wilderness environments. 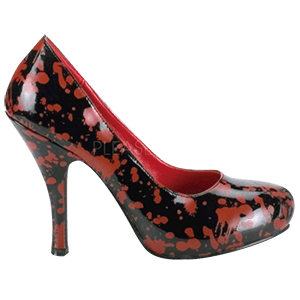 Other zombie shoes let you show off alternative styles, like our X-Ray pumps, stiletto boots, and ballet flats or our blood-spattered high heels, which work great for Halloween. Whether you are looking for a good pair of survival boots or just want to sport some zombie fashion at the next Zombie Walk, you have come to the right place! When the weather turns brisk, you will not have to feel the grasping fingers of the winter chill along your skin any longer! 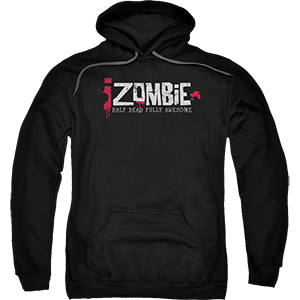 We offer a selection of warm and comfortable zombie hoodies and zombie jackets that can serve as outerwear to keep away the cold. Our zombie humor sweatshirts provide a unique perspective on these gruesome creatures, using puns of pop culture icons to create amusing designs. For a creepier look, check out the gory zombie styles that we have available with reaching hands and bloody text. No matter what style of zombie apparel you prefer, make sure to pick up these zombie sweatshirts so you can wear your favorite zombie designs at any time of year!